Tuesday evening December 6th, 2016 RG Munn Auctions will be putting 220 lots on the auction block and will be broadcasting this event live on the internet with fully interactive live bidding, audio, and video. 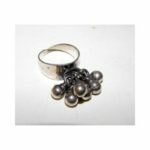 RG Munn is one of the premier auction houses of this type of material and always provide outstanding results to their consignors, buyers, and business partners. 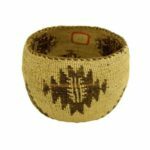 This auction includes art, baskets, rugs, kachinas, beadwork, jewelry, arrowheads, as well as a selection of beautiful paintings. 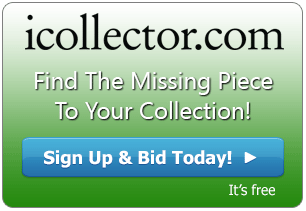 There will be a piece available for any collector and this auction will draw not only a national audience, but also interested collectors from around the world. A great by for pottery collectors shows at Lot 35. 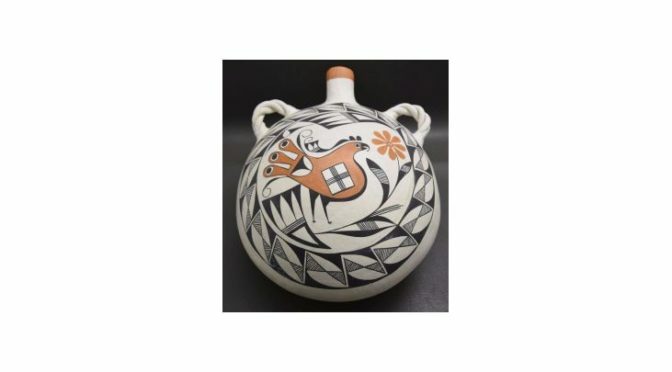 This is an Acoma Pottery Canteen signed by the artist E Histia. It is a 1970’s polychrome design depicting a bird. The measurements are 14” by 9” by 12”. Estimated in value from $300 -$600. Lot 177 provides another highlighted piece of pottery. 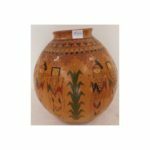 This is an Acoma Pottery Olla from artists Barbara and Joseph Cerno. Both have signed the piece and it is a 2010 poly chrome painted parrot design measuring 15” by 18”. This has an outstanding investment value of $3000 to $6000 and bidding opens at only $1500. Lot 61 gives bidders a chance at getting a beautiful Northwest Coast Totem Pole. This was made in the 1980’s and is a hand carved and painted wooden totem pole by artist Patrick Seale. Measuring 14” tall, it is signed by the artist. Opening for only $25 this is an auction bargain and a great piece to display. 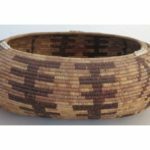 There are over 70 pieces of Navajo origin in the auction. A beautiful squash necklace is featured at Lot 214. This is a 1970s sterling silver and turquoise necklace that is 26” long and the Naja is 2.5” by 2.75”. The total weight of this outstanding work is 189 grams. There is a beautiful array of photos to view in the online catalog. A few lots later at Lot 220 is a must have Navajo Story Belt. From the 1960’s, this is a turquoise coral jet and shell set in a sterling silver buckle. The buckle is 2.25” by 3” and there are nine conchos marked BB on the belt. The total weight excluding the leather is 350 grams. The photos alone make this a must bid item for collectors as they are truly gorgeous. RG Munn Auctions will be broadcasting this auction with full audio, video, and real time internet bidding on Tuesday December 6th at 7PM Mountain time, coming from beautiful New Mexico. Registration is open and absentee bidding is currently open for bidders who cannot bid live during the auction. All items in the catalog have a selection of quality photos for inspection and RG Munn is available to answer any questions on all of their fine pieces in the auction.